This article is about the island country. For the movie franchise by DreamWorks, see Madagascar (franchise). For other uses, see Madagascar (disambiguation) and Malagasy (disambiguation). Madagascar (/ˌmædəˈɡæskər, -kɑːr/; Malagasy: Madagasikara), officially the Republic of Madagascar (Malagasy: Repoblikan'i Madagasikara Malagasy pronunciation: [republiˈkʲan madaɡasˈkʲarə̥]; French: République de Madagascar), and previously known as the Malagasy Republic, is an island country in the Indian Ocean, approximately 400 kilometres (250 miles) off the coast of East Africa. The nation comprises the island of Madagascar (the fourth-largest island in the world) and numerous smaller peripheral islands. Following the prehistoric breakup of the supercontinent Gondwana, Madagascar split from the Indian subcontinent around 88 million years ago, allowing native plants and animals to evolve in relative isolation. Consequently, Madagascar is a biodiversity hotspot; over 90% of its wildlife is found nowhere else on Earth. The island's diverse ecosystems and unique wildlife are threatened by the encroachment of the rapidly growing human population and other environmental threats. Madagascar belongs to the group of least developed countries, according to the United Nations. Malagasy and French are both official languages of the state. The majority of the population adheres to traditional beliefs, Christianity, or an amalgamation of both. Ecotourism and agriculture, paired with greater investments in education, health, and private enterprise, are key elements of Madagascar's development strategy. Under Ravalomanana, these investments produced substantial economic growth, but the benefits were not evenly spread throughout the population, producing tensions over the increasing cost of living and declining living standards among the poor and some segments of the middle class. As of 2017[update], the economy has been weakened by the 2009–2013 political crisis, and quality of life remains low for the majority of the Malagasy population. In the Malagasy language, the island of Madagascar is called Madagasikara (Malagasy pronunciation: [madaɡasʲˈkʲarə̥]) and its people are referred to as Malagasy. 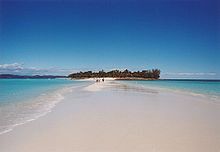 The island's appellation "Madagascar" is not of local origin but rather was popularized in the Middle Ages by Europeans. The name Madageiscar was first recorded in the memoirs of 13th-century Venetian explorer Marco Polo as a corrupted transliteration of the name Mogadishu, the Somali port with which Polo had confused the island. On St. Laurence's Day in 1500, Portuguese explorer Diogo Dias landed on the island and named it São Lourenço. Polo's name was preferred and popularized on Renaissance maps. No single Malagasy-language name predating Madagasikara appears to have been used by the local population to refer to the island, although some communities had their own name for part or all of the land they inhabited. The terraced paddy fields of the central highlands of Madagascar (left) give way to tropical rainforest along the eastern coast (center) bordered by the shores of the Indian Ocean (right). The prehistoric breakup of the supercontinent Gondwana separated the Madagascar–Antarctica–India landmass from the Africa–South America landmass around 135 million years ago. Madagascar later split from India about 88 million years ago during the late Cretaceous period allowing plants and animals on the island to evolve in relative isolation. Along the length of the eastern coast runs a narrow and steep escarpment containing much of the island's remaining tropical lowland forest. To the west of this ridge lies a plateau in the center of the island ranging in altitude from 750 to 1,500 m (2,460 to 4,920 ft) above sea level. These central highlands, traditionally the homeland of the Merina people and the location of their historic capital at Antananarivo, are the most densely populated part of the island and are characterized by terraced, rice-growing valleys lying between grassy hills and patches of the subhumid forests that formerly covered the highland region. To the west of the highlands, the increasingly arid terrain gradually slopes down to the Mozambique Channel and mangrove swamps along the coast. The grassy plains that dominate the western landscape are dotted with stony massifs (left), patches of deciduous forest, and baobab trees (center), while the south is characterized by desert and spiny forests (right). Madagascar's highest peaks rise from three prominent highland massifs: Maromokotro 2,876 m (9,436 ft) in the Tsaratanana Massif is the island's highest point, followed by Boby Peak 2,658 m (8,720 ft) in the Andringitra Massif, and Tsiafajavona 2,643 m (8,671 ft) in the Ankaratra Massif. To the east, the Canal des Pangalanes is a chain of man-made and natural lakes connected by canals built by the French just inland from the east coast and running parallel to it for some 600 km (370 mi). The western and southern sides, which lie in the rain shadow of the central highlands, are home to dry deciduous forests, spiny forests, and deserts and xeric shrublands. Due to their lower population densities, Madagascar's dry deciduous forests have been better preserved than the eastern rain forests or the original woodlands of the central plateau. The western coast features many protected harbors, but silting is a major problem caused by sediment from the high levels of inland erosion carried by rivers crossing the broad western plains. The combination of southeastern trade winds and northwestern monsoons produces a hot rainy season (November–April) with frequently destructive cyclones, and a relatively cooler dry season (May–October). Rain clouds originating over the Indian Ocean discharge much of their moisture over the island's eastern coast; the heavy precipitation supports the area's rainforest ecosystem. The central highlands are both drier and cooler while the west is drier still, and a semi-arid climate prevails in the southwest and southern interior of the island. Tropical cyclones cause damage to infrastructure and local economies as well as loss of life. In 2004, Cyclone Gafilo became the strongest cyclone ever recorded to hit Madagascar. The storm killed 172 people, left 214,260 homeless and caused more than US$250 million in damage. As a result of the island's long isolation from neighboring continents, Madagascar is home to various plants and animals found nowhere else on Earth. Approximately 90% of all plant and animal species found in Madagascar are endemic. This distinctive ecology has led some ecologists to refer to Madagascar as the "eighth continent", and the island has been classified by Conservation International as a biodiversity hotspot. More than 80 percent of Madagascar's 14,883 plant species are found nowhere else in the world, including five plant families. The family Didiereaceae, composed of four genera and 11 species, is limited to the spiny forests of southwestern Madagascar. Four-fifths of the world's Pachypodium species are endemic to the island. Three-fourths of Madagascar's 860 orchid species are found here alone, as are six of the world's nine baobab species. The island is home to around 170 palm species, three times as many as on all of mainland Africa; 165 of them are endemic. Many native plant species are used as herbal remedies for a variety of afflictions. The drugs vinblastine and vincristine are vinca alkaloids, used to treat Hodgkin's disease, leukemia, and other cancers, were derived from the Madagascar periwinkle. 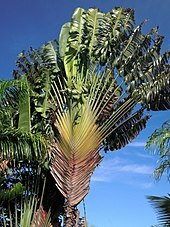 The traveler's palm, known locally as ravinala and endemic to the eastern rain forests, is highly iconic of Madagascar and is featured in the national emblem as well as the Air Madagascar logo. Like its flora, Madagascar's fauna is diverse and exhibits a high rate of endemism. Lemurs have been characterized as "Madagascar's flagship mammal species" by Conservation International. In the absence of monkeys and other competitors, these primates have adapted to a wide range of habitats and diversified into numerous species. As of 2012[update], there were officially 103 species and subspecies of lemur, 39 of which were described by zoologists between 2000 and 2008. They are almost all classified as rare, vulnerable, or endangered. At least 17 species of lemur have become extinct since humans arrived on Madagascar, all of which were larger than the surviving lemur species. A number of other mammals, including the cat-like fossa, are endemic to Madagascar. Over 300 species of birds have been recorded on the island, of which over 60 percent (including four families and 42 genera) are endemic. The few families and genera of reptile that have reached Madagascar have diversified into more than 260 species, with over 90 percent of these being endemic (including one endemic family). The island is home to two-thirds of the world's chameleon species, including the smallest known, and researchers have proposed that Madagascar may be the origin of all chameleons. Endemic fish of Madagascar include two families, 15 genera and over 100 species, primarily inhabiting the island's freshwater lakes and rivers. Although invertebrates remain poorly studied on Madagascar, researchers have found high rates of endemism among the known species. All 651 species of terrestrial snail are endemic, as are a majority of the island's butterflies, scarab beetles, lacewings, spiders and dragonflies. Tavy (slash-and-burn) destruction of native forest habitat is widespread (left), causing massive erosion (center) and silting of rivers (right). Madagascar's varied fauna and flora are endangered by human activity. Since the arrival of humans around 2,350 years ago, Madagascar has lost more than 90 percent of its original forest. This forest loss is largely fueled by tavy ("fat"), a traditional slash-and-burn agricultural practice imported to Madagascar by the earliest settlers. Malagasy farmers embrace and perpetuate the practice not only for its practical benefits as an agricultural technique, but for its cultural associations with prosperity, health and venerated ancestral custom (fomba malagasy). As human population density rose on the island, deforestation accelerated beginning around 1,400 years ago. By the 16th century, the central highlands had been largely cleared of their original forests. More recent contributors to the loss of forest cover include the growth in cattle herd size since their introduction around 1,000 years ago, a continued reliance on charcoal as a fuel for cooking, and the increased prominence of coffee as a cash crop over the past century. According to a conservative estimate, about 40 percent of the island's original forest cover was lost from the 1950s to 2000, with a thinning of remaining forest areas by 80 percent. In addition to traditional agricultural practice, wildlife conservation is challenged by the illicit harvesting of protected forests, as well as the state-sanctioned harvesting of precious woods within national parks. Although banned by then-President Marc Ravalomanana from 2000 to 2009, the collection of small quantities of precious timber from national parks was re-authorized in January 2009 and dramatically intensified under the administration of Andry Rajoelina as a key source of state revenues to offset cuts in donor support following Ravalomanana's ousting. Invasive species have likewise been introduced by human populations. Following the 2014 discovery in Madagascar of the Asian common toad, a relative of a toad species that has severely harmed wildlife in Australia since the 1930s, researchers warned the toad could "wreak havoc on the country's unique fauna." Habitat destruction and hunting have threatened many of Madagascar's endemic species or driven them to extinction. The island's elephant birds, a family of endemic giant ratites, became extinct in the 17th century or earlier, most probably because of human hunting of adult birds and poaching of their large eggs for food. Numerous giant lemur species vanished with the arrival of human settlers to the island, while others became extinct over the course of the centuries as a growing human population put greater pressures on lemur habitats and, among some populations, increased the rate of lemur hunting for food. A July 2012 assessment found that the exploitation of natural resources since 2009 has had dire consequences for the island's wildlife: 90 percent of lemur species were found to be threatened with extinction, the highest proportion of any mammalian group. Of these, 23 species were classified as critically endangered. By contrast, a previous study in 2008 had found only 38 percent of lemur species were at risk of extinction. In 2003, Ravalomanana announced the Durban Vision, an initiative to more than triple the island's protected natural areas to over 60,000 km2 (23,000 sq mi) or 10 percent of Madagascar's land surface. As of 2011[update], areas protected by the state included five Strict Nature Reserves (Réserves Naturelles Intégrales), 21 Wildlife Reserves (Réserves Spéciales) and 21 National Parks (Parcs Nationaux). In 2007 six of the national parks were declared a joint World Heritage Site under the name Rainforests of the Atsinanana. These parks are Marojejy, Masoala, Ranomafana, Zahamena, Andohahela and Andringitra. Local timber merchants are harvesting scarce species of rosewood trees from protected rainforests within Marojejy National Park and exporting the wood to China for the production of luxury furniture and musical instruments. To raise public awareness of Madagascar's environmental challenges, the Wildlife Conservation Society opened an exhibit entitled "Madagascar!" in June 2008 at the Bronx Zoo in New York. Archaeological finds such as cut marks on bones found in the northwest and stone tools in the northeast indicate that Madagascar was visited by foragers around 2000 BC. Early Holocene humans might have existed on the island 10,500 years ago, based on grooves found on elephant bird bones left by humans. However, a counter study concluded that human-made marks date to 1,200 years ago at the earliest, in which the previously mentioned bone damage may have been made by scavengers, ground movements or cuts from the excavation process. Traditionally, archaeologists have estimated that the earliest settlers arrived in successive waves throughout the period between 350 BC and 550 AD, while others are cautious about dates earlier than 250 AD. In either case, these dates make Madagascar one of the last major landmasses on Earth to be settled by humans. Upon arrival, early settlers practiced slash-and-burn agriculture to clear the coastal rainforests for cultivation. The first settlers encountered Madagascar's abundance of megafauna, including giant lemurs, elephant birds, giant fossa and the Malagasy hippopotamus, which have since become extinct because of hunting and habitat destruction. By 600 AD, groups of these early settlers had begun clearing the forests of the central highlands. Arab traders first reached the island between the 7th and 9th centuries. A wave of Bantu-speaking migrants from southeastern Africa arrived around 1000 AD. South Indian Tamil merchants arrived around 11th century. They introduced the zebu, a type of long-horned humped cattle, which they kept in large herds. Irrigated paddy fields were developed in the central highland Betsileo Kingdom and were extended with terraced paddies throughout the neighboring Kingdom of Imerina a century later. The rising intensity of land cultivation and the ever-increasing demand for zebu pasturage had largely transformed the central highlands from a forest ecosystem to grassland by the 17th century. The oral histories of the Merina people, who may have arrived in the central highlands between 600 and 1,000 years ago, describe encountering an established population they called the Vazimba. Probably the descendants of an earlier and less technologically advanced Austronesian settlement wave, the Vazimba were assimilated or expelled from the highlands by the Merina kings Andriamanelo, Ralambo and Andrianjaka in the 16th and early 17th centuries. Today, the spirits of the Vazimba are revered as tompontany (ancestral masters of the land) by many traditional Malagasy communities. Madagascar was an important transoceanic trading hub connecting ports of the Indian Ocean in the early centuries following human settlement. 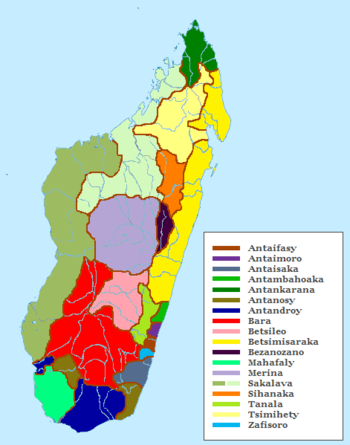 The written history of Madagascar began with the Arabs, who established trading posts along the northwest coast by at least the 10th century and introduced Islam, the Arabic script (used to transcribe the Malagasy language in a form of writing known as sorabe), Arab astrology, and other cultural elements. European contact began in 1500, when the Portuguese sea captain Diogo Dias sighted the island. The French established trading posts along the east coast in the late 17th century. Upon its emergence in the early 17th century, the highland kingdom of Imerina was initially a minor power relative to the larger coastal kingdoms and grew even weaker in the early 18th century when King Andriamasinavalona divided it among his four sons. 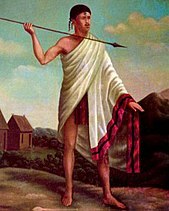 Following almost a century of warring and famine, Imerina was reunited in 1793 by King Andrianampoinimerina (1787–1810). From his initial capital Ambohimanga, and later from the Rova of Antananarivo, this Merina king rapidly expanded his rule over neighboring principalities. His ambition to bring the entire island under his control was largely achieved by his son and successor, King Radama I (1810–28), who was recognized by the British government as King of Madagascar. Radama concluded a treaty in 1817 with the British governor of Mauritius to abolish the lucrative slave trade in return for British military and financial assistance. Artisan missionary envoys from the London Missionary Society began arriving in 1818 and included such key figures as James Cameron, David Jones and David Griffiths, who established schools, transcribed the Malagasy language using the Roman alphabet, translated the Bible, and introduced a variety of new technologies to the island. Radama's successor, Queen Ranavalona I (1828–61), responded to increasing political and cultural encroachment on the part of Britain and France by issuing a royal edict prohibiting the practice of Christianity in Madagascar and pressuring most foreigners to leave the territory. She made heavy use of the traditional practice of fanompoana (forced labor as tax payment) to complete public works projects and develop a standing army of between 20,000 and 30,000 Merina soldiers, whom she deployed to pacify outlying regions of the island and further expand the Kingdom of Merina to encompass most of Madagascar. Residents of Madagascar could accuse one another of various crimes, including theft, Christianity and especially witchcraft, for which the ordeal of tangena was routinely obligatory. Between 1828 and 1861, the tangena ordeal caused about 3,000 deaths annually. In 1838, it was estimated that as many as 100,000 people in Imerina died as a result of the tangena ordeal, constituting roughly 20 percent of the population. The combination of regular warfare, disease, difficult forced labor and harsh measures of justice resulted in a high mortality rate among soldiers and civilians alike during her 33-year reign. Among those who continued to reside in Imerina were Jean Laborde, an entrepreneur who developed munitions and other industries on behalf of the monarchy, and Joseph-François Lambert, a French adventurer and slave trader, with whom then-Prince Radama II signed a controversial trade agreement termed the Lambert Charter. Succeeding his mother, Radama II (1861–63) attempted to relax the queen's stringent policies, but was overthrown two years later by Prime Minister Rainivoninahitriniony (1852–1865) and an alliance of Andriana (noble) and Hova (commoner) courtiers, who sought to end the absolute power of the monarch. Following the coup, the courtiers offered Radama's queen Rasoherina (1863–68) the opportunity to rule, if she would accept a power sharing arrangement with the Prime Minister—a new social contract that would be sealed by a political marriage between them. Queen Rasoherina accepted, first wedding Rainivoninahitriniony, then later deposing him and wedding his brother, Prime Minister Rainilaiarivony (1864–95), who would go on to marry Queen Ranavalona II (1868–83) and Queen Ranavalona III (1883–97) in succession. Over the course of Rainilaiarivony's 31-year tenure as prime minister, numerous policies were adopted to modernize and consolidate the power of the central government. Schools were constructed throughout the island and attendance was made mandatory. Army organization was improved, and British consultants were employed to train and professionalize soldiers. Polygamy was outlawed and Christianity, declared the official religion of the court in 1869, was adopted alongside traditional beliefs among a growing portion of the populace. Legal codes were reformed on the basis of British common law and three European-style courts were established in the capital city. In his joint role as Commander-in-Chief, Rainilaiarivony also successfully ensured the defense of Madagascar against several French colonial incursions. Primarily on the basis that the Lambert Charter had not been respected, France invaded Madagascar in 1883 in what became known as the first Franco-Hova War. At the end of the war, Madagascar ceded the northern port town of Antsiranana (Diego Suarez) to France and paid 560,000 francs to Lambert's heirs. 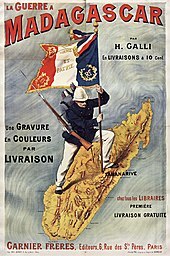 In 1890, the British accepted the full formal imposition of a French protectorate on the island, but French authority was not acknowledged by the government of Madagascar. To force capitulation, the French bombarded and occupied the harbor of Toamasina on the east coast, and Mahajanga on the west coast, in December 1894 and January 1895 respectively. A French military flying column then marched toward Antananarivo, losing many men to malaria and other diseases. Reinforcements came from Algeria and Sub-Saharan Africa. Upon reaching the city in September 1895, the column bombarded the royal palace with heavy artillery, causing heavy casualties and leading Queen Ranavalona III to surrender. France annexed Madagascar in 1896 and declared the island a colony the following year, dissolving the Merina monarchy and sending the royal family into exile on Réunion Island and to Algeria. A two-year resistance movement organized in response to the French capture of the royal palace was effectively put down at the end of 1897. Under colonial rule, plantations were established for the production of a variety of export crops. Slavery was abolished in 1896 and approximately 500,000 slaves were freed; many remained in their former masters' homes as servants or as sharecroppers; in many parts of the island strong discriminatory views against slave descendants are still held today. Wide paved boulevards and gathering places were constructed in the capital city of Antananarivo and the Rova palace compound was turned into a museum. Additional schools were built, particularly in rural and coastal areas where the schools of the Merina had not reached. Education became mandatory between the ages of 6 to 13 and focused primarily on French language and practical skills. The Merina royal tradition of taxes paid in the form of labor was continued under the French and used to construct a railway and roads linking key coastal cities to Antananarivo. Malagasy troops fought for France in World War I. In the 1930s, Nazi political thinkers developed the Madagascar Plan that had identified the island as a potential site for the deportation of Europe's Jews. During the Second World War, the island was the site of the Battle of Madagascar between the Vichy government and the British. The occupation of France during the Second World War tarnished the prestige of the colonial administration in Madagascar and galvanized the growing independence movement, leading to the Malagasy Uprising of 1947. This movement led the French to establish reformed institutions in 1956 under the Loi Cadre (Overseas Reform Act), and Madagascar moved peacefully towards independence. The Malagasy Republic was proclaimed on 14 October 1958, as an autonomous state within the French Community. A period of provisional government ended with the adoption of a constitution in 1959 and full independence on 26 June 1960. Philibert Tsiranana, the first president of Madagascar (1960–72). Since regaining independence, Madagascar has transitioned through four republics with corresponding revisions to its constitution. The First Republic (1960–72), under the leadership of French-appointed President Philibert Tsiranana, was characterized by a continuation of strong economic and political ties to France. Many high-level technical positions were filled by French expatriates, and French teachers, textbooks and curricula continued to be used in schools around the country. Popular resentment over Tsiranana's tolerance for this "neo-colonial" arrangement inspired a series of farmer and student protests that overturned his administration in 1972. Gabriel Ramanantsoa, a major general in the army, was appointed interim president and prime minister that same year, but low public approval forced him to step down in 1975. Colonel Richard Ratsimandrava, appointed to succeed him, was assassinated six days into his tenure. General Gilles Andriamahazo ruled after Ratsimandrava for four months before being replaced by another military appointee: Vice Admiral Didier Ratsiraka, who ushered in the socialist-Marxist Second Republic that ran under his tenure from 1975 to 1993. This period saw a political alignment with the Eastern Bloc countries and a shift toward economic insularity. These policies, coupled with economic pressures stemming from the 1973 oil crisis, resulted in the rapid collapse of Madagascar's economy and a sharp decline in living standards, and the country had become completely bankrupt by 1979. The Ratsiraka administration accepted the conditions of transparency, anti-corruption measures and free market policies imposed by the International Monetary Fund, World Bank and various bilateral donors in exchange for their bailout of the nation's broken economy. Opposition leader and then-mayor of Antananarivo, Andry Rajoelina, led a movement in early 2009 in which Ravalomanana was pushed from power in an unconstitutional process widely condemned as a coup d'état. In March 2009, Rajoelina was declared by the Supreme Court as the President of the High Transitional Authority, an interim governing body responsible for moving the country toward presidential elections. In 2010, a new constitution was adopted by referendum, establishing a Fourth Republic, which sustained the democratic, multi-party structure established in the previous constitution. Hery Rajaonarimampianina was declared the winner of the 2013 presidential election, which the international community deemed fair and transparent. The public directly elects the president and the 127 members of the National Assembly to five-year terms. All 33 members of the Senate serve six-year terms, with 22 senators elected by local officials and 11 appointed by the president. The last National Assembly election was held on 20 December 2013 and the last Senate election was held on 30 December 2015. At the local level, the island's 22 provinces are administered by a governor and provincial council. Provinces are further subdivided into regions and communes. The judiciary is modeled on the French system, with a High Constitutional Court, High Court of Justice, Supreme Court, Court of Appeals, criminal tribunals, and tribunals of first instance. The courts, which adhere to civil law, lack the capacity to quickly and transparently try the cases in the judicial system, often forcing defendants to pass lengthy pretrial detentions in unsanitary and overcrowded prisons. Antananarivo is the administrative capital and largest city of Madagascar. It is located in the highlands region, near the geographic center of the island. King Andrianjaka founded Antananarivo as the capital of his Imerina Kingdom around 1610 or 1625 upon the site of a captured Vazimba capital on the hilltop of Analamanga. 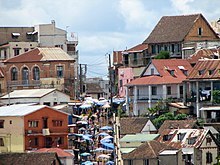 As Merina dominance expanded over neighboring Malagasy peoples in the early 19th century to establish the Kingdom of Madagascar, Antananarivo became the center of administration for virtually the entire island. In 1896 the French colonizers of Madagascar adopted the Merina capital as their center of colonial administration. The city remained the capital of Madagascar after regaining independence in 1960. In 2017, the capital's population was estimated at 1,391,433 inhabitants. The next largest cities are Antsirabe (500,000), Toamasina (450,000) and Mahajanga (400,000). Since Madagascar gained independence from France in 1960, the island's political transitions have been marked by numerous popular protests, several disputed elections, an impeachment, two military coups and one assassination. The island's recurrent political crises are often prolonged, with detrimental effects on the local economy, international relations and Malagasy living standards. 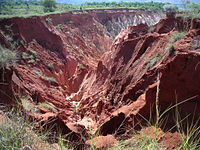 The eight-month standoff between incumbent Ratsiraka and challenger Marc Ravalomanana following the 2001 presidential elections cost Madagascar millions of dollars in lost tourism and trade revenue as well as damage to infrastructure, such as bombed bridges and buildings damaged by arson. A series of protests led by Andry Rajoelina against Ravalomanana in early 2009 became violent, with more than 170 people killed. Modern politics in Madagascar are colored by the history of Merina subjugation of coastal communities under their rule in the 19th century. The consequent tension between the highland and coastal populations has periodically flared up into isolated events of violence. Madagascar has historically been perceived as being on the margin of mainstream African affairs despite being a founding member of the Organisation of African Unity, which was established in 1963 and dissolved in 2002 to be replaced by the African Union. Madagascar was not permitted to attend the first African Union summit because of a dispute over the results of the 2001 presidential election, but rejoined the African Union in July 2003 after a 14-month hiatus. Madagascar was again suspended by the African Union in March 2009 following the unconstitutional transfer of executive power to Rajoelina. Madagascar is a member of the International Criminal Court with a Bilateral Immunity Agreement of protection for the United States military. Eleven countries have established embassies in Madagascar, including France, the United Kingdom, the United States, China and India, while Madagascar has embassies in sixteen other countries. Human rights in Madagascar are protected under the constitution and the state is a signatory to numerous international agreements including the Universal Declaration of Human Rights and the Convention on the Rights of the Child. Religious, ethnic and sexual minorities are protected under the law. Freedom of association and assembly are also guaranteed under the law, although in practice the denial of permits for public assembly has occasionally been used to impede political demonstrations. Torture by security forces is rare and state repression is low relative to other countries with comparably few legal safeguards, although arbitrary arrests and the corruption of military and police officers remain problems. Ravalomanana's 2004 creation of BIANCO, an anti-corruption bureau, resulted in reduced corruption among Antananarivo's lower-level bureaucrats in particular, although high-level officials have not been prosecuted by the bureau. The rise of centralized kingdoms among the Sakalava, Merina and other ethnic groups produced the island's first standing armies by the 16th century, initially equipped with spears but later with muskets, cannons and other firearms. By the early 19th century, the Merina sovereigns of the Kingdom of Madagascar had brought much of the island under their control by mobilizing an army of trained and armed soldiers numbering as high as 30,000. French attacks on coastal towns in the later part of the century prompted then-Prime Minister Rainilaiarivony to solicit British assistance to provide training to the Merina monarchy's army. Despite the training and leadership provided by British military advisers, the Malagasy army was unable to withstand French weaponry and was forced to surrender following an attack on the royal palace at Antananarivo. Madagascar was declared a colony of France in 1897. The political independence and sovereignty of the Malagasy armed forces, which comprises an army, navy and air force, was restored with independence from France in 1960. Since this time the Malagasy military has never engaged in armed conflict with another state or within its own borders, but has occasionally intervened to restore order during periods of political unrest. Under the socialist Second Republic, Admiral Didier Ratsiraka instated mandatory national armed or civil service for all young citizens regardless of gender, a policy that remained in effect from 1976 to 1991. The armed forces are under the direction of the Minister of the Interior and have remained largely neutral during times of political crisis, as during the protracted standoff between incumbent Ratsiraka and challenger Marc Ravalomanana in the disputed 2001 presidential elections, when the military refused to intervene in favor of either candidate. This tradition was broken in 2009, when a segment of the army defected to the side of Andry Rajoelina, then-mayor of Antananarivo, in support of his attempt to force President Ravalomanana from power. 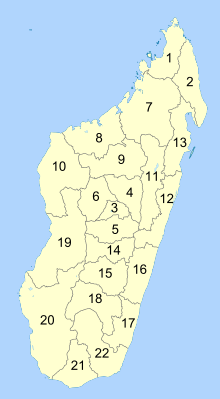 Madagascar is subdivided into 22 regions (faritra). The regions are further subdivided into 119 districts, 1,579 communes, and 17,485 fokontany. Agriculture has long influenced settlement on the island. Only 15% of the nation's 24,894,551 population live in the 10 largest cities. Madagascar became a Member State of the United Nations on 20 September 1960, shortly after gaining its independence on 26 June 1960. As of January 2017, 34 police officers from Madagascar are deployed in Haiti as part of the United Nations Stabilisation Mission in Haiti. Starting in 2015, under the direction of and with assistance from the UN, the World Food Programme started the Madagascar Country Programme with the two main goals of long-term development/ reconstruction efforts and addressing the food insecurity issues in the southern regions of Madagascar. These goals plan to be accomplished by providing meals for specific schools in rural and urban priority areas and by developing national school feeding policies to increase consistency of nourishment throughout the country. Small and local farmers have also been assisted in increasing both the quantity and quality of their production, as well as improving their crop yield in unfavorable weather conditions. Embroidered tablecloths are produced for sale to tourists at Nosy Komba. Madagascar's GDP in 2015 was estimated at US$9.98 billion, with a per capita GDP of $411.82. Approximately 69 percent of the population lives below the national poverty line threshold of one dollar per day. Over the last five years, the average growth rate has been 2.6% but is expected to have reached 4.1% in 2016, due to public works programs and a growth of the service sector. The agriculture sector constituted 29 percent of Malagasy GDP in 2011, while manufacturing formed 15 percent of GDP. Madagascar's other sources of growth are tourism, agriculture and the extractive industries. Tourism focuses on the niche eco-tourism market, capitalizing on Madagascar's unique biodiversity, unspoiled natural habitats, national parks and lemur species. An estimated 365,000 tourists visited Madagascar in 2008, but the sector declined during the political crisis with 180,000 tourists visiting in 2010. However, the sector has been growing steadily for a few years; In 2016, 293,000 tourists landed in the African island with an increase of 20% compared to 2015; For 2017 the country has the goal of reaching 366,000 visitors, while for 2018 government estimates are expected to reach 500,000 annual tourists. The island is still a very poor country in 2018; structural brakes remain in the development of the economy: corruption and the shackles of the public administration, lack of legal certainty, and backwardness of land legislation. The economy, however, has been growing since 2011, with GDP growth exceeding 4% per year; almost all economic indicators are growing, the GDP per capita was around $1600 (PPP) for 2017, one of the lowest in the world, although growing since 2012; unemployment was also cut, which in 2016 was equal to 2.1% with a work force of 13.4 million as of 2017. The main economic resources of Madagascar are tourism, textiles, agriculture, and mining. Madagascar's natural resources include a variety of unprocessed agricultural and mineral resources. Agriculture (including the growing of raffia), fishing and forestry are mainstays of the economy. Madagascar is the world's principal supplier of vanilla, cloves and ylang-ylang. Madagascar supplies 80% of the world's natural vanilla. Other key agricultural resources include coffee, lychees and shrimp. Key mineral resources include various types of precious and semi-precious stones, and Madagascar currently provides half of the world's supply of sapphires, which were discovered near Ilakaka in the late 1990s. Madagascar has one of the world's largest reserves of ilmenite (titanium ore), as well as important reserves of chromite, coal, iron, cobalt, copper and nickel. Several major projects are underway in the mining, oil and gas sectors that are anticipated to give a significant boost to the Malagasy economy. These include such projects as ilmenite and zircon mining from heavy mineral sands near Tôlanaro by Rio Tinto, extraction of nickel near Moramanga and its processing near Toamasina by Sherritt International, and the development of the giant onshore heavy oil deposits at Tsimiroro and Bemolanga by Madagascar Oil. Exports formed 28 percent of GDP in 2009. Most of the country's export revenue is derived from the textiles industry, fish and shellfish, vanilla, cloves and other foodstuffs. France is Madagascar's main trading partner, although the United States, Japan and Germany also have strong economic ties to the country. 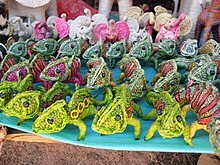 The Madagascar-U.S. Business Council was formed in May 2003, as a collaboration between USAID and Malagasy artisan producers to support the export of local handicrafts to foreign markets. Imports of such items as foodstuffs, fuel, capital goods, vehicles, consumer goods and electronics consume an estimated 52 percent of GDP. The main sources of Madagascar's imports include China, France, Iran, Mauritius and Hong Kong. In 2010, Madagascar had approximately 7,617 km (4,730 mi) of paved roads, 854 km (530 mi) of railways and 432 km (270 mi) of navigable waterways. The majority of roads in Madagascar are unpaved, with many becoming impassable in the rainy season. Largely paved national routes connect the six largest regional towns to Antananarivo, with minor paved and unpaved routes providing access to other population centers in each district. There are several rail lines. Antananarivo is connected to Toamasina, Ambatondrazaka and Antsirabe by rail, and another rail line connects Fianarantsoa to Manakara. The most important seaport in Madagascar is located on the east coast at Toamasina. Ports at Mahajanga and Antsiranana are significantly less used because of their remoteness. The island's newest port at Ehoala, constructed in 2008 and privately managed by Rio Tinto, will come under state control upon completion of the company's mining project near Tôlanaro around 2038. Air Madagascar services the island's many small regional airports, which offer the only practical means of access to many of the more remote regions during rainy season road washouts. Running water and electricity are supplied at the national level by a government service provider, Jirama, which is unable to service the entire population. As of 2009[update], only 6.8 percent of Madagascar's fokontany had access to water provided by Jirama, while 9.5 percent had access to its electricity services. Fifty-six percent of Madagascar's power is provided by hydroelectric power plants, with the remaining 44% provided by diesel engine generators. Mobile telephone and internet access are widespread in urban areas but remain limited in rural parts of the island. Approximately 30% of the districts are able to access the nations' several private telecommunications networks via mobile telephones or land lines. Radio broadcasts remain the principal means by which the Malagasy population access international, national, and local news. Only state radio broadcasts are transmitted across the entire island. Hundreds of public and private stations with local or regional range provide alternatives to state broadcasting. In addition to the state television channel, a variety of privately owned television stations broadcast local and international programming throughout Madagascar. Several media outlets are owned by political partisans or politicians themselves, including the media groups MBS (owned by Ravalomanana) and Viva (owned by Rajoelina), contributing to political polarization in reporting. The media have historically come under varying degrees of pressure to censor their criticism of the government. Reporters are occasionally threatened or harassed, and media outlets are periodically forced to close. Accusations of media censorship have increased since 2009 because of the alleged intensification of restrictions on political criticism. Access to the internet has grown dramatically over the past decade, with an estimated 352,000 residents of Madagascar accessing the internet from home or in one of the nation's many internet cafés in December 2011. Maternal mortality declined after 1990 but rose sharply after 2009 because of political instability. Medical centers, dispensaries and hospitals are found throughout the island, although they are concentrated in urban areas and particularly in Antananarivo. Access to medical care remains beyond the reach of many Malagasy, especially in the rural areas, and many recourse to traditional healers. In addition to the high expense of medical care relative to the average Malagasy income, the prevalence of trained medical professionals remains extremely low. In 2010, Madagascar had an average of three hospital beds per 10,000 people and a total of 3,150 doctors, 5,661 nurses, 385 community health workers, 175 pharmacists, and 57 dentists for a population of 22 million. Fifteen percent of government spending in 2008 was directed toward the health sector. Approximately 70 percent of spending on health was contributed by the government, while 30 percent originated with international donors and other private sources. The government provides at least one basic health center per commune. Private health centers are concentrated within urban areas and particularly those of the central highlands. Despite these barriers to access, health services have shown a trend toward improvement over the past twenty years. Child immunizations against such diseases as hepatitis B, diphtheria, and measles increased an average of 60 percent in this period, indicating low but increasing availability of basic medical services and treatments. The Malagasy fertility rate in 2009 was 4.6 children per woman, declining from 6.3 in 1990. Teen pregnancy rates of 14.8 percent in 2011, much higher than the African average, are a contributing factor to rapid population growth. In 2010, the maternal mortality rate was 440 per 100,000 births, compared to 373.1 in 2008 and 484.4 in 1990, indicating a decline in perinatal care following the 2009 coup. The infant mortality rate in 2011 was 41 per 1,000 births, with an under-five mortality rate at 61 per 1,000 births. Schistosomiasis, malaria, and sexually transmitted diseases are common in Madagascar, although infection rates of AIDS remain low relative to many countries in mainland Africa, at 0.2 percent of the adult population. The malaria mortality rate is also among the lowest in Africa at 8.5 deaths per 100,000 people, in part because of the highest frequency use of insecticide treated nets in Africa. Adult life expectancy in 2009 was 63 years for men and 67 years for women. In 2017, Madagascar had an outbreak of the bubonic plague (also known as the black death) that affected urban areas. Prior to the 19th century, all education in Madagascar was informal and typically served to teach practical skills as well as social and cultural values, including respect for ancestors and elders. The first formal European-style school was established in 1818 at Toamasina by members of the London Missionary Society (LMS). The LMS was invited by King Radama I to expand its schools throughout Imerina to teach basic literacy and numeracy to aristocratic children. The schools were closed by Ranavalona I in 1835 but reopened and expanded in the decades after her death. By the end of the 19th century, Madagascar had the most developed and modern school system in pre-colonial Sub-Saharan Africa. Access to schooling was expanded in coastal areas during the colonial period, with French language and basic work skills becoming the focus of the curriculum. During the post-colonial First Republic, a continued reliance on French nationals as teachers, and French as the language of instruction, displeased those desiring a complete separation from the former colonial power. 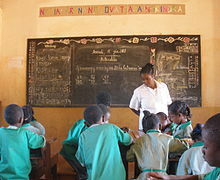 Consequently, under the socialist Second Republic, French instructors and other nationals were expelled, Malagasy was declared the language of instruction, and a large cadre of young Malagasy were rapidly trained to teach at remote rural schools under the mandatory two-year national service policy. This policy, known as malgachization, coincided with a severe economic downturn and a dramatic decline in the quality of education. Those schooled during this period generally failed to master the French language or many other subjects and struggled to find employment, forcing many to take low-paying jobs in the informal or black market that mired them in deepening poverty. Excepting the brief presidency of Albert Zafy, from 1992 to 1996, Ratsiraka remained in power from 1975 to 2001 and failed to achieve significant improvements in education throughout his tenure. Education was prioritized under the Ravalomanana administration (2002–09), and is currently free and compulsory from ages 6 to 13. The primary schooling cycle is five years, followed by four years at the lower secondary level and three years at the upper secondary level. During Ravalomanana's first term, thousands of new primary schools and additional classrooms were constructed, older buildings were renovated, and tens of thousands of new primary teachers were recruited and trained. Primary school fees were eliminated, and kits containing basic school supplies were distributed to primary students. Government school construction initiatives have ensured at least one primary school per fokontany and one lower secondary school within each commune. At least one upper secondary school is located in each of the larger urban centers. The three branches of the national public university are located at Antananarivo, Mahajanga, and Fianarantsoa. These are complemented by public teacher-training colleges and several private universities and technical colleges. In 2016, the population of Madagascar was estimated at 25 million, up from 2.2 million in 1900. The annual population growth rate in Madagascar was approximately 2.9 percent in 2009. Approximately 42.5 percent of the population is younger than 15 years of age, while 54.5 percent are between the ages of 15 and 64. Those aged 65 and older form 3 percent of the total population. Only two general censuses, in 1975 and 1993, have been carried out after independence. The most densely populated regions of the island are the eastern highlands and the eastern coast, contrasting most dramatically with the sparsely populated western plains. The Malagasy ethnic group forms over 90 percent of Madagascar's population and is typically divided into 18 ethnic subgroups. Recent DNA research revealed that the genetic makeup of the average Malagasy person constitutes an approximately equal blend of Southeast Asian and East African genes, although the genetics of some communities show a predominance of Southeast Asian or East African origins or some Arab, Indian, or European ancestry. Southeast Asian features – specifically from the southern part of Borneo – are most predominant among the Merina of the central highlands, who form the largest Malagasy ethnic subgroup at approximately 26 percent of the population, while certain communities among the coastal peoples (collectively called côtiers) have relatively stronger East African features. The largest coastal ethnic subgroups are the Betsimisaraka (14.9 percent) and the Tsimihety and Sakalava (6 percent each). Chinese, Indian and Comoran minorities are present in Madagascar, as well as a small European (primarily French) populace. Emigration in the late 20th century has reduced these minority populations, occasionally in abrupt waves, such as the exodus of Comorans in 1976, following anti-Comoran riots in Mahajanga. By comparison, there has been no significant emigration of Malagasy peoples. The number of Europeans has declined since independence, reduced from 68,430 in 1958 to 17,000 three decades later. There were an estimated 25,000 Comorans, 18,000 Indians, and 9,000 Chinese living in Madagascar in the mid-1980s. The Malagasy language is of Malayo-Polynesian origin and is generally spoken throughout the island. The numerous dialects of Malagasy, which are generally mutually intelligible, can be clustered under one of two subgroups: eastern Malagasy, spoken along the eastern forests and highlands including the Merina dialect of Antananarivo, and western Malagasy, spoken across the western coastal plains. French became the official language during the colonial period, when Madagascar came under the authority of France. In the first national Constitution of 1958, Malagasy and French were named the official languages of the Malagasy Republic. Madagascar is a francophone country, and French is mostly spoken as a second language among the educated population and used for international communication. No official languages were recorded in the Constitution of 1992, although Malagasy was identified as the national language. Nonetheless, many sources still claimed that Malagasy and French were official languages, eventually leading a citizen to initiate a legal case against the state in April 2000, on the grounds that the publication of official documents only in the French language was unconstitutional. The High Constitutional Court observed in its decision that, in the absence of a language law, French still had the character of an official language. In the Constitution of 2007, Malagasy remained the national language while official languages were reintroduced: Malagasy, French, and English. English was removed as an official language from the constitution approved by voters in the November 2010 referendum. The outcome of the referendum, and its consequences for official and national language policy, are not recognized by the political opposition, who cite lack of transparency and inclusiveness in the way the election was organized by the High Transitional Authority. According to the U.S. Department of State in 2011, 41% of Madagascans practiced Christianity, and 52% adhered to traditional religions, which tends to emphasize links between the living and the razana (ancestors). But according to the Pew Research Center in 2010, 85% of the population practiced Christianity, while just 4.5% of Madagascans practiced folk religions; among Christians, practitioners of Protestantism outnumbered adherents of Roman Catholicism. The veneration of ancestors has led to the widespread tradition of tomb building, as well as the highlands practice of the famadihana, whereby a deceased family member's remains are exhumed and re-wrapped in fresh silk shrouds, before being replaced in the tomb. The famadihana is an occasion to celebrate the beloved ancestor's memory, reunite with family and community, and enjoy a festive atmosphere. Residents of surrounding villages are often invited to attend the party, where food and rum are typically served, and a hiragasy troupe or other musical entertainment is commonly present. Consideration for ancestors is also demonstrated through adherence to fady, taboos that are respected during and after the lifetime of the person who establishes them. It is widely believed that by showing respect for ancestors in these ways, they may intervene on behalf of the living. Conversely, misfortunes are often attributed to ancestors whose memory or wishes have been neglected. The sacrifice of zebu is a traditional method used to appease or honor the ancestors. In addition, the Malagasy traditionally believe in a creator god, called Zanahary or Andriamanitra. Today, many Christians integrate their religious beliefs with traditional ones related to honoring the ancestors. For instance, they may bless their dead at church before proceeding with traditional burial rites or invite a Christian minister to consecrate a famadihana reburial. The Malagasy Council of Churches comprises the four oldest and most prominent Christian denominations of Madagascar (Roman Catholic, Church of Jesus Christ in Madagascar, Lutheran, and Anglican) and has been an influential force in Malagasy politics. Islam is also practiced on the island. Islam was first brought to Madagascar in the Middle Ages by Arab and Somali Muslim traders, who established several Islamic schools along the eastern coast. While the use of Arabic script and loan words and the adoption of Islamic astrology would spread across the island, the Islamic religion took hold in only a handful of southeastern coastal communities. Today, Muslims constitute 3–7 percent of the population of Madagascar and are largely concentrated in the northwestern provinces of Mahajanga and Antsiranana. The vast majority of Muslims are Sunni. Muslims are divided between those of Malagasy ethnicity, Indians, Pakistanis and Comorans. More recently, Hinduism was introduced to Madagascar through Gujarati people immigrating from the Saurashtra region of India in the late 19th century. Most Hindus in Madagascar speak Gujarati or Hindi at home. Each of the many ethnic subgroups in Madagascar adhere to their own set of beliefs, practices and ways of life that have historically contributed to their unique identities. However, there are a number of core cultural features that are common throughout the island, creating a strongly unified Malagasy cultural identity. 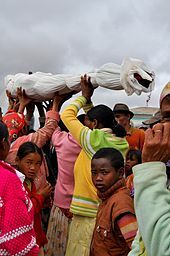 In addition to a common language and shared traditional religious beliefs around a creator god and veneration of the ancestors, the traditional Malagasy worldview is shaped by values that emphasize fihavanana (solidarity), vintana (destiny), tody (karma), and hasina, a sacred life force that traditional communities believe imbues and thereby legitimates authority figures within the community or family. Other cultural elements commonly found throughout the island include the practice of male circumcision; strong kinship ties; a widespread belief in the power of magic, diviners, astrology and witch doctors; and a traditional division of social classes into nobles, commoners, and slaves. Although social castes are no longer legally recognized, ancestral caste affiliation often continues to affect social status, economic opportunity, and roles within the community. Malagasy people traditionally consult Mpanandro ("Makers of the Days") to identify the most auspicious days for important events such as weddings or famadihana, according to a traditional astrological system introduced by Arabs. Similarly, the nobles of many Malagasy communities in the pre-colonial period would commonly employ advisers known as the ombiasy (from olona-be-hasina, "man of much virtue") of the southeastern Antemoro ethnic group, who trace their ancestry back to early Arab settlers. The diverse origins of Malagasy culture are evident in its tangible expressions. The most emblematic instrument of Madagascar, the valiha, is a bamboo tube zither carried to Madagascar by early settlers from southern Borneo, and is very similar in form to those found in Indonesia and the Philippines today. Traditional houses in Madagascar are likewise similar to those of southern Borneo in terms of symbolism and construction, featuring a rectangular layout with a peaked roof and central support pillar. Reflecting a widespread veneration of the ancestors, tombs are culturally significant in many regions and tend to be built of more durable material, typically stone, and display more elaborate decoration than the houses of the living. The production and weaving of silk can be traced back to the island's earliest settlers, and Madagascar's national dress, the woven lamba, has evolved into a varied and refined art. The Southeast Asian cultural influence is also evident in Malagasy cuisine, in which rice is consumed at every meal, typically accompanied by one of a variety of flavorful vegetable or meat dishes. African influence is reflected in the sacred importance of zebu cattle and their embodiment of their owner's wealth, traditions originating on the African mainland. Cattle rustling, originally a rite of passage for young men in the plains areas of Madagascar where the largest herds of cattle are kept, has become a dangerous and sometimes deadly criminal enterprise as herdsmen in the southwest attempt to defend their cattle with traditional spears against increasingly armed professional rustlers. A wide variety of oral and written literature has developed in Madagascar. One of the island's foremost artistic traditions is its oratory, as expressed in the forms of hainteny (poetry), kabary (public discourse) and ohabolana (proverbs). An epic poem exemplifying these traditions, the Ibonia, has been handed down over the centuries in several different forms across the island, and offers insight into the diverse mythologies and beliefs of traditional Malagasy communities. This tradition was continued in the 20th century by such artists as Jean-Joseph Rabearivelo, who is considered Africa's first modern poet, and Elie Rajaonarison, an exemplar of the new wave of Malagasy poetry. Madagascar has also developed a rich musical heritage, embodied in dozens of regional musical genres such as the coastal salegy or highland hiragasy that enliven village gatherings, local dance floors and national airwaves. Madagascar also has a growing culture of classical music fostered through youth academies, organizations and orchestras that promote youth involvement in classical music. Moraingy is a traditional martial art of Madagascar. 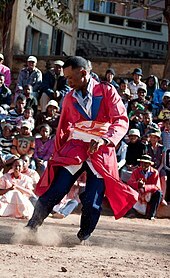 A number of traditional pastimes have emerged in Madagascar. Moraingy, a type of hand-to-hand combat, is a popular spectator sport in coastal regions. It is traditionally practiced by men, but women have recently begun to participate. The wrestling of zebu cattle, which is named savika or tolon-omby, is also practiced in many regions. In addition to sports, a wide variety of games are played. Among the most emblematic is fanorona, a board game widespread throughout the Highland regions. According to folk legend, the succession of King Andrianjaka after his father Ralambo was partially the result of the obsession that Andrianjaka's older brother may have had with playing fanorona to the detriment of his other responsibilities. Western recreational activities were introduced to Madagascar over the past two centuries. Rugby union is considered the national sport of Madagascar. Soccer is also popular. Madagascar has produced a world champion in pétanque, a French game similar to lawn bowling, which is widely played in urban areas and throughout the Highlands. School athletics programs typically include soccer, track and field, judo, boxing, women's basketball and women's tennis. Madagascar sent its first competitors to the Olympic Games in 1964, and has also competed in the African Games. Scouting is represented in Madagascar by its own local federation of three scouting clubs. Membership in 2011 was estimated at 14,905. Because of its advanced sports facilities, Antananarivo gained the hosting rights for several of Africa's top international basketball events, including the 2011 FIBA Africa Championship, the 2009 FIBA Africa Championship for Women, the 2014 FIBA Africa Under-18 Championship, the 2013 FIBA Africa Under-16 Championship, and the 2015 FIBA Africa Under-16 Championship for Women. Malagasy cuisine reflects the diverse influences of Southeast Asian, African, Indian, Chinese and European culinary traditions. The complexity of Malagasy meals can range from the simple, traditional preparations introduced by the earliest settlers, to the refined festival dishes prepared for the island's 19th-century monarchs. Throughout almost the entire island, the contemporary cuisine of Madagascar typically consists of a base of rice (vary) served with an accompaniment (laoka). The many varieties of laoka may be vegetarian or include animal proteins, and typically feature a sauce flavored with such ingredients as ginger, onion, garlic, tomato, vanilla, coconut milk, salt, curry powder, green peppercorns or, less commonly, other spices or herbs. In parts of the arid south and west, pastoral families may replace rice with maize, cassava, or curds made from fermented zebu milk. A wide variety of sweet and savory fritters as well as other street foods are available across the island, as are diverse tropical and temperate-climate fruits. Locally produced beverages include fruit juices, coffee, herbal teas and teas, and alcoholic drinks such as rum, wine, and beer. Three Horses Beer is the most popular beer on the island and is considered emblematic of Madagascar. The island also produces some of the world's finest chocolate; Chocolaterie Robert, established in 1940, is the most famous chocolate company on the island. ^ a b Le Comité Consultatif Constitutionnel (1 October 2010). "Projet de Constitution de la Quatrième République de Madagascar" (in French). Madagascar Tribune. Archived from the original (PDF) on 24 August 2011. Retrieved 24 August 2011. ^ "MADAGASCAR: general data". Populstat.info. Retrieved 15 July 2013. ^ "Demonyms – Names of Nationalities". Geography.about.com. Retrieved 15 July 2013. ^ "Malagasy – National Geographic Style Manual". Retrieved 27 February 2017. ^ a b c d "Madagascar". International Monetary Fund. ^ a b c Bradt (2011), p. 2. ^ "For Thousands of Years, Humans Coexisted with the Largest Birds That Ever Lived". 13 September 2018. ^ "About LDCs". UN-OHRLLS. Retrieved 22 February 2017. ^ National Geographic. "Style Manual". Archived from the original on 31 August 2012. Retrieved 31 August 2012. ^ a b c d e f g h i j k l m n o p q Bureau of African Affairs (3 May 2011). "Background Note: Madagascar". U.S. Department of State. Archived from the original on 24 August 2011. Retrieved 24 August 2011. ^ Central Intelligence Agency (2011). "Madagascar". The World Factbook. Archived from the original on 24 August 2011. Retrieved 24 August 2011. ^ University of Berkeley: Understanding Evolution (October 2009). "Where did all of Madagascar's species come from?". Archived from the original on 19 March 2011. Retrieved 19 March 2011. ^ a b c Vences M, Wollenberg KC, Vieites DR, Lees DC (June 2009). "Madagascar as a model region of species diversification". Trends in Ecology and Evolution. 24 (8): 456–465. doi:10.1016/j.tree.2009.03.011. PMID 19500874. Archived from the original (PDF) on 11 February 2012. Retrieved 11 February 2012. ^ a b c d e f g Encyclopædia Britannica (2011). "Madagascar". Encyclopædia Britannica. Eb.com. Archived from the original on 25 August 2011. Retrieved 25 August 2011. ^ a b c d e f g h i j k l m n o p q r s t u Metz, Helen Chapin (1994). "Library of Congress Country Studies: Madagascar". Archived from the original on 1 February 2011. Retrieved 1 February 2011. ^ a b International Federation of Red Cross And Red Crescent Societies (25 February 2005). "Madagascar: Cyclone Gafilo, Final Report, Appeal 08/04". ReliefWeb. Archived from the original on 31 August 2012. Retrieved 31 March 2011. ^ Integrated Regional Information Networks (2 July 2004). "Madagascar: Saving the children from Gafilo's aftermath". ReliefWeb. Archived from the original on 9 September 2012. Retrieved 9 September 2012. ^ a b c d e f Conservation International (2007). "Madagascar and the Indian Ocean Islands". Biodiversity Hotspots. Conservation International. Archived from the original on 24 August 2011. Retrieved 24 August 2011. ^ Tattersall, Ian (2006). Origin of the Malagasy Strepshirhine Primates. Springer. pp. 1–6. ISBN 978-0-387-34585-7. ^ Lavranos, John (2004). "Pachypodium makayense: A New Species From Madagascar". Cactus and Succulent Journal. 76 (2): 85–88. ^ Baum DA, Small RL, Wendel JF (1998). "Biogeography and floral evolution of baobabs (Adansonia, Bombacaceae) as inferred from multiple data sets". Systematic Biology. 47 (2): 181–207. doi:10.1080/106351598260879. PMID 12064226. ^ a b Keglevich, Péter; Hazai, Laszlo; Kalaus, György; Szántay, Csaba (2012). "Modifications on the basic skeletons of vinblastine and vincristine". Molecules. 17 (5): 5893–5914. doi:10.3390/molecules17055893. PMC 6268133. PMID 22609781. ^ Sears, Justin E.; Boger, Dale L. (2015). "Total Synthesis of Vinblastine, Related Natural Products, and Key Analogues and Development of Inspired Methodology Suitable for the Systematic Study of Their Structure-Function Properties". Accounts of Chemical Research. 48 (3): 653–662. doi:10.1021/ar500400w. PMC 4363169. PMID 25586069. ^ Kuboyama, Takeshi; Yokoshima, Satoshi; Tokuyama, Hidetoshi; Fukuyama, Tohru (2004). "Stereocontrolled total synthesis of (+)-vincristine". Proceedings of the National Academy of Sciences of the United States of America. 101 (33): 11966–11970. Bibcode:2004PNAS..10111966K. doi:10.1073/pnas.0401323101. PMC 514417. PMID 15141084. ^ "Chemotherapy for Hodgkin Lymphoma". cancer.org. American Cancer Society. 29 March 2017. Retrieved 22 June 2017. "Chemotherapy for Non-Hodgkin Lymphoma". cancer.org. American Cancer Society. 31 May 2016. Retrieved 22 June 2017. ^ "Chemotherapy for Acute Lymphocytic Leukemia". cancer.org. American Cancer Society. 18 February 2016. Retrieved 22 June 2017. "Chemotherapy for Chronic Myeloid Leukemia". cancer.org. American Cancer Society. 22 February 2016. Retrieved 22 June 2017. "Chemotherapy for Childhood Leukemia". cancer.org. American Cancer Society. 3 February 2016. Retrieved 22 June 2017. ^ "Chemotherapy for Neuroblastoma". cancer.org. American Cancer Society. 22 January 2016. Retrieved 22 June 2017. "Chemotherapy for Brain and Spinal Cord Tumors in Children". cancer.org. American Cancer Society. 21 January 2016. Retrieved 22 June 2017. "Chemotherapy for Non-Small Cell Lung Cancer". cancer.org. American Cancer Society. 16 May 2016. Retrieved 22 June 2017. "Chemotherapy for Testicular Cancer". cancer.org. American Cancer Society. 12 February 2016. Retrieved 22 June 2017. ^ Foster, Steven (2010). "From Herbs to Medicines: The Madagascar Periwinkle's Impact on Childhood Leukemia: A Serendipitous Discovery for Treatment". Alternative and Complementary Therapies. 16 (6): 347–350. doi:10.1089/act.2010.16609. PMID 20423206. ^ McLendon, Chuck (16 May 2000). "Ravenala madagascariensis". Floridata.com. Archived from the original on 20 March 2011. Retrieved 14 September 2009. ^ Lambahoany Ecotourism Centre (24 August 2011). "Nature of Madagascar". Lambahoany Ecotourism Centre. Archived from the original on 24 August 2011. Retrieved 24 August 2011. ^ Mittermeier, R.A.; Wallis, J.; Rylands, A.B. ; Ganzhorn, J.U. ; Oates, J.F. ; Williamson, E.A. ; Palacios, E.; Heymann, E.W. ; Kierulff, M.C.M. ; Yongcheng, Long; Supriatna, J.; Roos, C.; Walker, S.; Cortés-Ortiz, L.; Schwitzer, C., eds. (2009). "Primates in Peril: The World's 25 Most Endangered Primates 2008–2010" (PDF). Illustrated by S.D. Nash. IUCN/SSC Primate Specialist Group, International Primatological Society, and Conservation International: 1–92. ^ a b Black, Richard (13 July 2012). "Lemurs sliding toward extinction". BBC News. Archived from the original on 26 August 2012. Retrieved 26 August 2012. ^ Jungers, W.L. ; Godfrey, L.R. ; Simons, E.L.; Chatrath, P.S. (1997). "Phalangeal curvature and positional behavior in extinct sloth lemurs (Primates, Palaeopropithecidae)". Proceedings of the National Academy of Sciences USA. 94 (22): 11998–2001. Bibcode:1997PNAS...9411998J. doi:10.1073/pnas.94.22.11998. PMC 23681. PMID 11038588. ^ a b Okajima Y & Kumazawa Y (2009). "Mitogenomic perspectives into iguanid phylogeny and biogeography: Gondwanan vicariance for the origin of Madagascan oplurines". Gene. 441 (1–2): 28–35. doi:10.1016/j.gene.2008.06.011. PMID 18598742. ^ Glaw, F.; Köhler, J. R.; Townsend, T. M.; Vences, M. (2012). Salamin, Nicolas (ed.). "Rivaling the World's Smallest Reptiles: Discovery of Miniaturized and Microendemic New Species of Leaf Chameleons (Brookesia) from Northern Madagascar". PLoS ONE. 7 (2): e31314. Bibcode:2012PLoSO...731314G. doi:10.1371/journal.pone.0031314. PMC 3279364. PMID 22348069. ^ "Everglades, Madagascar Rain Forest on UNESCO List". ABC News. 30 July 2010. Archived from the original on 20 March 2011. Retrieved 11 February 2011. ^ World Wildlife Fund, ed. (2001). "Madagascar subhumid forests". WildWorld Ecoregion Profile. National Geographic Society. Archived from the original on 8 March 2010. Retrieved 30 April 2006. ^ a b c d Gade, Daniel W. (1996). "Deforestation and its effects in Highland Madagascar". Mountain Research and Development. 16 (2): 101–116. doi:10.2307/3674005. JSTOR 3674005. ^ Campbell, Gwyn (1993). "The Structure of Trade in Madagascar, 1750–1810". The International Journal of African Historical Studies. 26 (1): 111–148. doi:10.2307/219188. JSTOR 219188. ^ Harper, Grady J.; Steininger, Marc; Tucker, Compton; Juhn, Daniel; Hawkins, Frank (2007). "Fifty years of deforestation and forest fragmentation in Madagascar". Environmental Conservation. 34 (4): 325–333. doi:10.1017/S0376892907004262. ^ a b c d e f g Bachelard, Jerome; Marcus, Richard (2011). "Countries at the Crossroads 2011: Madagascar". Freedom House. Archived from the original (PDF) on 25 August 2012. Retrieved 25 August 2012. ^ Morelle, Rebecca (29 May 2014). "Asian relative of cane toad threatens Madagascar havoc". BBC News. Retrieved 29 July 2014. ^ Handwerk, Brian (21 August 2009). "Lemurs Hunted, Eaten Amid Civil Unrest, Group Says". National Geographic News. Archived from the original on 20 March 2011. Retrieved 15 March 2011. ^ Madagascar National Parks (2011). "The Conservation". parcs-madagascar.com. Archived from the original on 25 August 2011. Retrieved 25 August 2011. ^ "Rainforests of the Atsinanana". UNESCO. Archived from the original on 25 August 2011. Retrieved 30 April 2011. ^ Bearak, Barry (24 May 2010). "Shaky Rule in Madagascar Threatens Trees". New York Times. Archived from the original on 20 March 2011. Retrieved 20 March 2011. ^ Luna, Kenny. "Madagascar! to Open at Bronx Zoo in Green, Refurbished Lion House". Treehugger. Archived from the original on 10 July 2011. Retrieved 11 June 2011. ^ Gommery, D.; Ramanivosoa, B.; Faure, M.; Guérin, C.; Kerloc'h, P.; Sénégas, F.; Randrianantenaina, H. (2011). "Oldest evidence of human activities in Madagascar on subfossil hippopotamus bones from Anjohibe (Mahajanga Province)". Comptes Rendus Palevol. 10 (4): 271–278. doi:10.1016/j.crpv.2011.01.006. ^ Dewar, R. E.; Radimilahy, C.; Wright, H. T.; Jacobs, Z.; Kelly, G. O.; Berna, F. (2013). "Stone tools and foraging in northern Madagascar challenge Holocene extinction models". Proceedings of the National Academy of Sciences of the United States of America. 110 (31): 12583–12588. Bibcode:2013PNAS..11012583D. doi:10.1073/pnas.1306100110. PMC 3732966. PMID 23858456. ^ Hansford, James; Wright, Patricia C.; Rasoamiaramanana, Armand; Pérez, Ventura R.; Godfrey, Laurie R.; Errickson, David; Thompson, Tim; Turvey, Samuel T. (12 September 2018). "Early Holocene human presence in Madagascar evidenced by exploitation of avian megafauna". Science Advances. 4 (9): eaat6925. Bibcode:2018SciA....4.6925H. doi:10.1126/sciadv.aat6925. PMC 6135541. PMID 30214938. ^ Anderson, Atholl; Clark, Geoffrey; Haberle, Simon; Higham, Tom; Nowak-Kemp, Malgosia; Prendergast, Amy; Radimilahy, Chantal; Rakotozafy, Lucien M.; Ramilisonina; Schwenninger, Jean-Luc; Virah-Sawmy, Malika; Camens, Aaron (12 September 2018). "New evidence of megafaunal bone damage indicates late colonization of Madagascar". PLOS ONE. 13 (10): e0204368. Bibcode:2018PLoSO..1304368A. doi:10.1371/journal.pone.0204368. PMC 6179221. PMID 30303989. ^ Crowley, B.E. (2010). "A refined chronology of prehistoric Madagascar and the demise of the megafauna". Quaternary Science Reviews. 29 (19–20): 2591–2603. Bibcode:2010QSRv...29.2591C. doi:10.1016/j.quascirev.2010.06.030. ^ Virah-Sawmy, M.; Willis, K. J.; Gillson, L. (2010). "Evidence for drought and forest declines during the recent megafaunal extinctions in Madagascar". Journal of Biogeography. 37 (3): 506–519. doi:10.1111/j.1365-2699.2009.02203.x. ^ a b c Campbell, Gwyn (1993). "The Structure of Trade in Madagascar, 1750–1810". The International Journal of African Historical Studies. 26 (1): 111–148. doi:10.2307/219188. JSTOR 219188. ^ a b Domenichini, J.P. "Antehiroka et Royauté Vazimba". Express de Madagascar (in French). Madatana.com. Archived from the original on 10 July 2011. Retrieved 5 November 2010. ^ Razafimahazo, S. (2011). "Vazimba: Mythe ou Realité?". Revue de l'Océan Indien (in French). Madatana.com. Archived from the original on 10 July 2011. Retrieved 8 November 2010. ^ "Kingdoms of Madagascar: Maroserana and Merina". Metmuseum.org. Archived from the original on 10 July 2011. Retrieved 25 April 2010. ^ "Royal Hill of Ambohimanga". UNESCO. Archived from the original on 10 July 2011. Retrieved 30 April 2011. ^ Campbell, Gwyn (October 1991). "The state and pre-colonial demographic history: the case of nineteenth century Madagascar". Journal of African History. 23 (3): 415–445. ^ a b c Marcus, Richard (August 2004). "Political change in Madagascar: populist democracy or neopatrimonialism by another name?" (Occasional Paper no. 89). Institute for Security Studies. Archived from the original on 7 September 2004. Retrieved 15 February 2012. ^ a b c "Madagascar: La Crise a un Tournant Critique?". International Crisis Group (in French). Archived from the original on 10 July 2011. Retrieved 25 November 2010. ^ "Centre d'actualités de l'ONU – Madagascar : l'ONU salue le bon déroulement du deuxième tour des élections présidentielles". Un.org. 20 December 2013. Retrieved 10 February 2014. ^ "Madagascar finally elects Senate after 2009 coup". Business Standard India. Business Standard. 30 December 2015. Retrieved 27 February 2017. ^ a b c d "Madagascar Profile: Media". BBC News. 20 June 2012. Archived from the original on 25 August 2012. Retrieved 25 August 2012. ^ "Population of Cities in Madagascar (2017)". worldpopulationreview.com. ^ "MADAGASCAR: Former president sentenced to five years in prison". Irinnews.org. 17 December 2003. Archived from the original on 10 July 2011. Retrieved 25 April 2010. ^ "Madagascar: Appeal launched despite political uncertainty". Irinnews.org. 7 April 2009. Archived from the original on 10 July 2011. Retrieved 25 April 2010. ^ a b Leithead, Alastair (14 May 2002). "Ethnic strife rocks Madagascar". BBC News. Archived from the original on 22 January 2012. Retrieved 22 January 2012. ^ "Pressure grows on Madagascar coup". BBC News. 20 March 2009. Archived from the original on 10 July 2011. Retrieved 30 March 2009. ^ "The Military Balance 2010". International Institute of Strategic Studies. pp. 314–315, 467. Archived from the original (PDF) on 1 April 2011. Retrieved 1 April 2011. ^ a b c d e f g "Presentation des resultats de la cartographie numerique en preparation du troisieme recensement generale de la population et de l'habitation" (Press release) (in French). Institut nationale de la statistique (INSTAT), Government of Madagascar. 2010. Archived from the original (PDF) on 15 January 2012. Retrieved 15 January 2012. ^ Ralison, Eliane; Goossens, Frans (January 2006). World Food Programme (ed.). Madagascar: profile des marches pour les evaluations d'urgence de la securite alimentaire. Strengthening Emergency Needs Assessment Capacity (in French). Rome, Italy: Katholieke Universiteit Leuven. p. 3. Archived from the original (PDF) on 14 January 2012. Retrieved 14 January 2012. ^ Institut National de la Statistique, Madagascar. ^ "United Nations Member States | Meetings Coverage and Press Releases". www.un.org. Retrieved 2 February 2017. ^ United Nations (31 January 2017). "UN Mission's Contributions by Country" (PDF). www.un.org. Retrieved 27 February 2017. ^ a b "Madagascar Country Programme (2015–2019) | World Food Programme". www1.wfp.org. Retrieved 22 February 2017. ^ "World Bank". Retrieved 27 February 2017. ^ "World Development Indicators – Google Public Data Explorer". www.google.com. Retrieved 22 February 2017. ^ "Madagascar at a glance". World Bank. 25 February 2011. Archived from the original (PDF) on 4 February 2012. Retrieved 4 February 2012. ^ "Madagascar Overview". www.worldbank.org. Retrieved 22 February 2017. ^ Christie, Iain; Crompton, Elizabeth (November 2003). "Republic of Madagascar: Tourism Sector Study". Africa Region Working Paper No. 63. Antananarivo: World Bank. Archived from the original (PDF) on 28 January 2012. Retrieved 28 January 2012. ^ "Madagascar – GDP (real growth rate) – Historical Data Graphs per Year". ^ "Business news: Fmi, economia del Madagascar manifesta segnali "incoraggianti"". Agenzia Nova. ^ "Madagascar - GDP - per capita (PPP) - Historical Data Graphs per Year". ^ "Madagascar – Unemployment rate – Historical Data Graphs per Year". ^ "Madagascar – Labor force – Historical Data Graphs per Year". ^ United Nations (2013). "FAO Stat". Food and Agriculture Organization. Retrieved 13 April 2013. ^ Pilling, David (5 June 2018). "The real price of Madagascar's vanilla boom". Financial Times. ^ a b "About QMM". Rio Tinto. 2009. Archived from the original on 19 September 2012. Retrieved 19 September 2012. ^ "Metals – Ambatovy Joint Venture". Sherritt International Corporation. 2012. Archived from the original on 19 September 2012. Retrieved 19 September 2012. ^ "Madagascar's oil fortunes evolving slowly". PennWell Corporation. 6 February 2012. Archived from the original on 19 September 2012. Retrieved 19 September 2012. ^ a b c Ashamu, Charlotte; Gomez-Pickering, Diego; Luke, Amanda; Morrison, Paul; Pedersen, Mark; Symes, Mara; Weyandt, Marthe (2005). "Made in Madagascar: Exporting Handicrafts to the U.S. Market: Final Report". United Nations Public-Private Alliance for Rural Development. Archived from the original (PDF) on 10 July 2011. Retrieved 10 July 2011. ^ "Production Electricité" (in French). Jirama. 2011. Retrieved 28 August 2013. ^ Legrip-Randriambelo, Olivia; Regnier, Denis (2014). "The place of healers-diviners (ombiasa) in Betsileo medical pluralism". Health, Culture & Society. 7 (1): 28–37. doi:10.5195/hcs.2014.188. ^ a b c d World Health Statistics 2011. Paris: World Health Organization. 2011. ISBN 978-92-4-156419-9. Archived from the original (PDF) on 21 January 2012. Retrieved 21 January 2012. ^ "The State Of The World's Midwifery". United Nations Population Fund. August 2011. Archived from the original on 22 January 2012. Retrieved 22 January 2012. ^ Beaumont, Peter (19 October 2017). "'It is a dangerous moment': Madagascar plague death toll reaches 74". The Guardian. Retrieved 21 October 2017. ^ Ranaivoson, Samuel (1980). "La formation du personnel enseignant de l'éducation de base à Madagascar: Une etude de cas. Quelques reflections intéressant la programmation de l'assistance de l'UNICEF" (in French). Paris: UNESCO. Archived from the original (PDF) on 10 July 2011. Retrieved 10 July 2011. ^ Mukonoweshuro, E.G. (1990). "State "resilience" and chronic political instability in Madagascar". Canadian Journal of African Studies. 24 (3): 376–398. doi:10.2307/485627. JSTOR 485627. ^ a b c Lassibille, Gerard; Tan, Jee-Peng; Jesse, Cornelia; Nguyen, Trang Van (6 August 2010). "Managing for results in primary education in Madagascar: Evaluating the impact of selected workflow interventions". The World Bank Economic Review. 24 (2): 303–329. doi:10.1093/wber/lhq009. Archived from the original on 11 February 2012. Retrieved 10 February 2012. ^ Ministère de l'Education Secondaire et l'Education de Base (2005). "Curriculum de formation des élèves-maîtres" (in French). Antananarivo, Madagascar: Government Printing Office. ^ "Haute Cour Constitutionnelle De Madagascar, Décision n°03-HCC/D2 Du 12 avril 2000" (in French). Saflii.org. 12 April 2000. Archived from the original on 10 July 2011. Retrieved 25 April 2010. ^ "Madagascar: 2007 Constitutional referendum". Electoral Institute for the Sustainability of Democracy in Africa. June 2010. Archived from the original on 22 January 2012. Retrieved 22 January 2012. ^ a b "Religions in Madagascar | PEW-GRF". Globalreligiousfutures.org. Retrieved 20 September 2017. ^ a b Bearak, Barry (5 September 2010). "Dead Join the Living in a Family Celebration". New York Times. p. A7. Archived from the original on 13 January 2012. Retrieved 13 January 2012. ^ "Report of the High Level Committee on the Indian Diaspora". Ministry of External Affairs, India. 2004. Archived from the original (PDF) on 31 August 2012. Retrieved 22 January 2012. ^ Kus, Susan; Raharijaona, Victor (2000). "House to Palace, Village to State: Scaling up Architecture and Ideology". American Anthropologist. New Series. 1 (102): 98–113. doi:10.1525/aa.2000.102.1.98. ^ Ravalitera, P. "Origine Confuse des Vazimba du Betsiriry". Journal Express (in French). Madatana.com. Archived from the original on 10 July 2011. Retrieved 11 November 2010. ^ Unknown. "Ibonia: the text in 17 sections". University of Virginia. Archived from the original on 10 July 2011. Retrieved 15 November 2010. ^ "Woodcrafting Knowledge of the Zafimaniry". UNESCO. Archived from the original on 24 August 2012. Retrieved 24 August 2012. ^ "Des nouveaux talents mis en relief". L'Express de Madagascar (in French). l'expressmada.com. 7 August 2009. Archived from the original on 24 August 2012. Retrieved 24 August 2012. ^ City of Antananarivo. "Antananarivo: Histoire de la commune" (in French). Archived from the original on 17 February 2011. Retrieved 2 August 2010. ^ "Madagascar take Sevens honours". International Rugby Board. 23 August 2007. Archived from the original on 29 August 2012. Retrieved 24 July 2012. ^ Vegar, Ness (4 October 1999). "Madagascar won the World Championship". petanque.org. Archived from the original on 14 January 2011. Retrieved 14 January 2011. ^ "Triennal review: Census as of 1 December 2010". World Organization of the Scout Movement. 1 December 2010. Archived from the original (PDF) on 31 August 2012. Retrieved 13 January 2011. ^ "THB Pilsener" (in French). Brasseries Star. 2015. Retrieved 5 June 2015. ^ Marsaud, Olivia (12 July 2008). "THB, star de la bière à Madagascar" (in French). Afrik.com. Retrieved 5 June 2015. ^ "Un peu d'histoire" (in French). Chocolaterie Robert. 2016. Retrieved 26 February 2017. Ade Ajayi, Jacob Festus (1989). General history of Africa: Africa in the nineteenth century until the 1880s. Paris: UNESCO. ISBN 978-0-520-03917-9. Adelaar, Alexander (2006). "The Indonesian migrations to Madagascar: Making sense of the multidisciplinary evidence". In Simanjuntak, Truman; Pojoh, Ingrid; Harriet Eileen; Hisyam, Muhamad (eds.). Austronesian diaspora and the ethnogeneses of people in Indonesian archipelago. Jakarta, Indonesia: LIPI Press. ISBN 978-979-26-2436-6. Auzias, Dominique; Labourdette, Jean-Paul (2008). Petit Futé: Madagascar 2008 (in French). Paris: Petit Futé. ISBN 978-2-7469-1982-2. Barendse, R.J. (2002). The Arabian seas: the Indian Ocean world of the seventeenth century. Berlin: M.E. Sharpe. ISBN 978-0-7656-0729-4. Bradt, Hilary (2011). Madagascar, 10th Ed. : The Bradt Travel Guide. London: Bradt Travel Guides. ISBN 978-1-84162-341-2. Browning, Christopher R. (2004). The Origins of the Final Solution. Jerusalem: Martyrs' and Heroes' Remembrance Authority. ISBN 978-3-540-63293-1. Chapus, G.S. ; Mondain, G. (1953). Un homme d'etat malgache: Rainilaiarivony (in French). Paris: Editions Diloutremer. Cousins, William Edward (1895). Madagascar of to-day: A sketch of the island, with chapters on its past history and present prospects. London: The Religious Tract Society. Davies, S.J.J.F. (2003). "Birds I: Tinamous and Ratites to Hoatzins". In Hutchins, Michael (ed.). Grzimek's Animal Life Encyclopedia. 8 (2 ed.). Farmington Hills, MI: Gale Group. ISBN 978-0-7876-5784-0. Deschamps, Hubert Jules (1965). Histoire de Madagascar (in French). Ann Arbor, MI: Berger-Levrault. Ellis, William (1859). Three visits to Madagascar during ... 1853-1854-1856. London: Oxford University. Emoff, Ron (2004). "Spitting into the wind: Multi-edged environmentalism in Malagasy song". In Dawe, Kevin (ed.). Island Musics. New York: Berg. ISBN 978-1-85973-703-3. Fage, J.D. ; Flint, J.E. ; Oliver, R.A. (1986). The Cambridge History of Africa: From c. 1790 to c. 1870. London: Cambridge University Press. ISBN 978-0-521-20413-2. Fournet-Guérin, Catherine (2007). Vivre à Tananarive: géographie du changement dans la capitale malgache (in French). Antananarivo, Madagascar: Karthala Editions. ISBN 978-2-84586-869-4. Freeman, Joseph John; Johns, David (1840). A narrative of the persecution of the Christians in Madagascar: with details of the escape of six Christian refugees now in England. London: J. Snow. Frémigacci, Jean (1999). "Le Rova de Tananarive: Destruction d'un lieu saint ou constitution d'une référence identitaire?". In Chrétien, Jean-Pierre (ed.). Histoire d'Afrique (in French). Paris: Editions Karthala. ISBN 978-2-86537-904-0. Gallieni, Joseph-Simon (1908). Neuf ans à Madagascar (in French). Paris: Librairie Hachette. Heale, Jay; Abdul Latif, Zawiah (2008). Cultures of the World: Madagascar. Tarrytown, NY: Marshall Cavendish. ISBN 978-0-7614-3036-0. Hillstrom, Kevin; Collier Hillstrom, Laurie (2003). Africa and the Middle East: a continental overview of environmental issues. Santa Barbara, CA: ABC-CLIO. ISBN 978-1-57607-688-0. Hobbes, Joseph; Dolan, Andrew (2008). World Regional Geography. Belmont, CA: Cengage Learning. ISBN 978-0-495-38950-7. Hodder, Ian (1982). Symbolic and structural archaeology. New York: Cambridge University Press. ISBN 978-0-521-24406-0. Kusimba, Chapurukha; Odland, J. Claire; Bronson, Bennet (2004). Unwrapping the textile traditions of Madagascar. Textile Series. Los Angeles: Regents of the University of California. ISBN 978-0-930741-95-2. Lehoullier, Sara (2010). Madagascar: Travel Companion. New York: Other Places Publishing. ISBN 978-0-9822619-5-8. Middleton, Karen (1999). Ancestors, Power, and History in Madagascar. Los Angeles: Brill. ISBN 978-90-04-11289-6. Moriarty, H.A. (1891). Islands in the southern Indian Ocean, westward of longitude 80 ̊east, including Madagascar. London: J. D. Potter. Ogot, Bethwell (1992). Africa from the Sixteenth to the Eighteenth Century. Paris: UNESCO. ISBN 978-92-3-101711-7. Oliver, Roland; Fage, John Donnelly; Sanderson, G.N. (1985). The Cambridge History of Africa. Journal of Arid Environments. 6. Cambridge, U.K.: Cambridge University Press. p. 195. Bibcode:1983JArEn...6..195S. doi:10.1016/S0140-1963(18)31535-0. ISBN 978-0-521-22803-9. Oliver, Samuel Pasfield (1886). Madagascar: an historical and descriptive account of the island and its former dependencies, Volume 1. London: Macmillan. Pryor, Frederic L. (1990). The political economy of poverty, equity, and growth: Malawi and Madagascar. Washington, D.C.: World Bank. ISBN 978-0-19-520823-8. Rabearivelo, Jean-Joseph (2007) [1936 (translation by Robert Ziller)]. Translated from the Night. Pittsburgh, PA: Lascaux Editions. ISBN 978-1-60461-552-4. Rajaonarimanana, Narivelo (2001). Grammaire moderne de la langue malgache. Langues INALCO (in French). Paris: Langues et mondes – l'Asiatheque. ISBN 978-2-911053-79-5. Ralibera, Daniel (1993). Madagascar et le christianisme (in French). Paris: Editions Karthala. ISBN 978-92-9028-211-2. Randier, Jean (2006). La Royale: L'histoire illustrée de la Marine nationale française (in French). Maîtres du Vent – La Falaise: Babouji. ISBN 978-2-35261-022-9. Randrianary, Victor (2001). Madagascar: les chants d'une île (in French). Paris: Actes Sud. ISBN 978-2-7427-3556-3. Ratsimbazafy, Ernest (2010). "Moraingy". In Green, Thomas; Svinth, Joseph (eds.). Martial Arts of the World: An Encyclopedia of History and Innovation, Volume 2. Santa Barbara, CA: ABC CLIO. ISBN 978-1-59884-243-2. Regnier, Denis (2015). "Clean people, unclean people: the essentialisation of 'slaves' among the southern Betsileo of Madagascar". Social Anthropology. 23 (2): 152–158. doi:10.1111/1469-8676.12107. Reinsch, Paul Samuel (1905). Colonial Administration. New York: Macmillan. Rodd, Tony; Stackhouse, Jennifer (2008). Trees: A Visual Guide. Los Angeles: University of California Press. ISBN 978-0-520-25650-7. Room, Adrian (2006). Placenames of the world: origins and meanings of the names for 6,600 countries, cities, territories, natural features, and historic sites. Jefferson, NC: McFarland. ISBN 978-0-7864-2248-7. Sharp, Leslie (2002). The Sacrificed Generation: Youth, History, and the Colonized Mind in Madagascar. Berkeley, CA: University of California Press. ISBN 978-0-520-22951-8. Shillington, Kevin (2005). Encyclopedia of African history. New York: CRC Press. ISBN 978-1-57958-453-5. Strakes, Jason (2006). "Armed Forces of the People". In Leonard, Thomas M. (ed.). Encyclopedia of the developing world. 1. New York: Taylor & Francis. ISBN 978-1-57958-388-0. Van Den Boogaerde, Pierre (2008). Shipwrecks of Madagascar. New York: AEG Publishing Group. ISBN 978-1-60693-494-4. Wink, André (2004). Volume 3 of Al-Hind: The Making of the Indo-Islamic World: Indo-Islamic society, 14th–15th centuries. Leiden, The Netherlands: Brill. ISBN 978-90-04-13561-1. "Madagascar". The World Factbook. Central Intelligence Agency.